Fisher Towers are a series of towers made of Cutler sandstone capped with Moenkopi sandstone and caked with a stucco of red mud located near Moab, Utah (38°43′26″N 109°18′30″W﻿ / ﻿38.7240°N 109.3083°W﻿ / 38.7240; -109.3083). The Towers are named for a miner who lived near them in the 1880s. The Tower is world-renowned as a subject for photography and for its classic rock climbing routes. 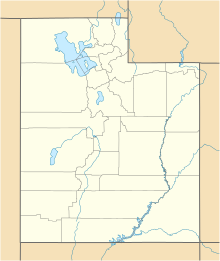 The nearest town is Moab, Utah about 16 miles (26 km) to the southwest. The area is generally accessed from Fisher Towers Road off of Route 128 which runs along the Colorado River between I-70 and Route 191. Castleton Tower is visible approximately 6 miles (9.7 km) to the southwest from different parts of the Fisher Tower's area. The Towers lie just south of a larger mesa which they are emerging from on a geological time scale. 1,000 feet (300 m) north of the main formation there is a tower which has only partway emerged from the mesa. The Towers are composed of three major fins of rock that run from the northeast closer to the mesa out to the southwest and into a desert valley. The fins are between 1,000 and 2,000 feet (300 and 610 m) long and separated from each other by about 1,000 feet (300 m). Each fin contains multiple towers, a number of which have been named. The eastern-most section of the northern most fin is dominated by a tower known as the King Fisher. The ridge line of the fin drops considerable before reaching the western formation called Ancient Arts. The Ancient Arts is composed of four separate summits the most striking of which is the cork screw summit. The Middle fin is split into two very distinct towers known as Echo Tower in the east and Cottontail in the west. The southern most fin is best known for containing the Fisher Towers with the greatest elevation and prominence, a structure named Titan Tower. The eastern portion of the southern fin is the less well known Oracle which physically connects back to the mesa. The area has many other named structures, such as the Cobra (which collapsed, presumably due to a lightning strike, sometime in the final week of July 2014) and the Sundial, both found in between King Fisher and Echo Tower. Each consists of balanced rocks perched above smaller supports. Another example is the Lizard Rock, a 60-foot (18 m) tower near the parking lot. Development of Fisher Towers as climbing areas start in the early 1960s. The first notable technical climb was a route called the Finger of Fate, which summits Titan Tower and was later featured in Fifty Classic Climbs of North America. The Towers are also very well known for the cork screw summit of the Ancient Arts tower, most commonly accessed by the Stolen Chimney route. Photographs of the unusual cork screw summit have been extensively published in many settings including mainstream advertisements. The Fisher Towers were featured in the opening scene of Austin Powers in Goldmember. Television commercials, advertisements, and even scenes from famous movies have been filmed in the area of Moab, Utah (where the Fisher Towers are located). Bjørnstad, Eric (1999). Rock climbing desert rock III : Moab to Colorado National Monument. Helena, MO: Falcon. ISBN 1-56044-754-0. Knapp, Fred (2002). Classic Desert Climbs (2nd ed.). Sharp End Publishing. ISBN 1-892540-17-7. Green, Stewart M. (1998). Rock climbing Utah. Helena, Mont. : Falcon. ISBN 1560445947. ^ "Fisher Towers". Geographic Names Information System. United States Geological Survey. Retrieved 2016-04-18. ^ Bjørnstad, Eric (1999). Desert Rock III. Helena, MO: Falcon. ISBN 1-56044-754-0. ^ Knapp, Fred (2002). Classic Desert Climbs (2nd ed.). Sharp End Publishing. ISBN 1-892540-17-7. ^ "Iconic rock formation, The Cobra, crumbles". GrindTV.com. Retrieved 2014-08-11. ^ Dobner, Jennifer (2014-08-05). "Popular, snakelike 'Cobra' rock formation beheaded in Utah". Reuters. Retrieved 2014-08-11. ^ "The Cobra Rock Formation Has Crumbled". Allproudamericans.com. 2014-08-06. Retrieved 2014-08-11. ^ Kroese, Mark (2001). Fifty Favorite Climbs: The Ultimate North American Tick List. The Mountaineers Books. ISBN 0-89886-728-2. ^ Citibank ThankYou Card Commercial. 21 Nov 2011. Retrieved 14 Oct 2012. Alex Honnold and Katie Brown climbing the Ancient Arts tower. Wikimedia Commons has media related to Fisher Towers. "Fishers Towers Trail". Bureau of Land Management. "Fisher Towers". Mountain Project. Retrieved 2011-05-15. "Fisher Towers". rockclimbing.com. Retrieved 2011-05-15. "Fisher Towers/Onion Creek Towers". SummitPost.org. Retrieved 2011-05-15. This page was last edited on 23 August 2017, at 07:01 (UTC).